During my clinical hours at Garner-Hayfield-Ventura High School in the fall of 2013, I created a rubric for a research paper in a 12th grade English classroom. I was very interested in this specific research paper because the student whose paper I was examining seemed deficient in several areas, especially for being a 12th-grader. I decided to create a rubric based off of her paper to learn more about the criteria I would assess as a future teacher, and what grade I would give this particular student. I thought this was a standard that best reflected the purpose of a research paper because a student has to write an informative text that is a synthesis of factual information gathered, plus personal input. The writer not only has to display content clearly, but also has to select and organize relevant material in the first place. I thought this standard covered all areas of research paper writing. (a) Introduce a topic; organize complex ideas, concepts, and information so that each new element builds on that which precedes it to create a unified whole. (b) Develop the topic thoroughly by selecting the most significant and relevant facts, details, quotations, or other information and examples appropriate to the audience’s knowledge of topic. (c) Use appropriate and varied transitions and syntax to link the major sections of the text, create cohesion, and clarify the relationships among complex ideas and concepts. I thought that these benchmarks accurately depicted what a teacher would want his/her students to achieve based on this standard. The benchmarks cover the selection and organization of information, the development of the essay, the appropriateness of content, and the overall cohesion of the paper. Because of the twelfth grade level, I thought that this standard and its benchmarks would be appropriate, as the next step for these students would be college-level writing. There is a strong CIA (curriculum-instruction-assessment) match between the standard and benchmarks and the rubric I created. First and foremost, the teacher will need to have previously explained the components of a research paper before the students begin. As a part of the curriculum, students will know how to search for relevant information, how to cite their sources, and how to synthesize between facts and personal input within their paper—these all match perfectly with the standard and benchmarks. The instruction from the teacher will deal with sourcing, cohesion, and editing of the paper. The actual assessment of the paper will be provided through the rubric, which accurately assesses all components from the curriculum and instruction as well as the standard and benchmarks; thus, there is a strong match between all three parts. The students will have obtained the skills to write a well-developed research paper though the curriculum and the teacher; the assessment will provide a valid representation of the students’ skills because it accurately measures what it is intended to measure. 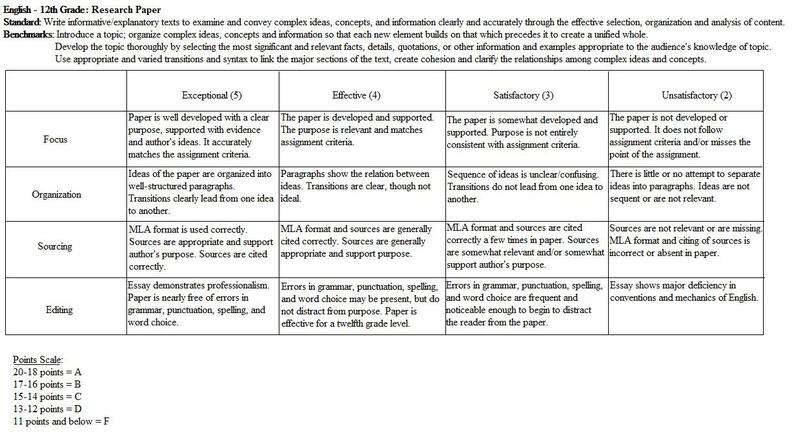 This rubric is created to assess the research paper as a product. The actual paper is what is being assessed. It is very easy for the teacher to maintain a record of the student’s achievement through the rubric. For one, the categories are clearly labeled on the rubric with the points possible for each portion. The teacher will assess the paper, as a product, based on the four categories: Focus, Organization, Sourcing, and Editing. For each category there are up to five points possible—five points out of five places the student within the Exceptional category for that component. This paper will be graded on an analytic scale, meaning each component—Focus, Organization, Sourcing, Editing—is graded individually then added together for a total score. I chose the analytic method because I believe it is a great way of assessing this research paper. It allows the teacher to grade each component separately to make sure that the student is truly achieving the selected benchmarks. On the bottom of the rubric, a grading scale is provided. As it states, 20-18 points is an ‘A’ letter grade, 17-16 is a ‘B’, 15-14 ‘C’, 13-12 ‘D’, and 11 points and below is an ‘F’. The rubric in its entirety uses student-friendly language that is clear and easy to interpret. Overall, I chose to create my rubric based on a research paper assignment because I thought it would give me the best, and most relevant, practice in assessment. It is also something that I would use in my future as an English teacher. Because of the match between the standard/benchmarks, assignment, and rubric, I believe that this rubric is something that will be a successful assessment tool.